If you’ve got a kid with a fertile imagination (who doesn’t? ), who’s ready to move up from Where The Wild Things Are, this is a great time to introduce him or her to Greek gods, myths and legends. 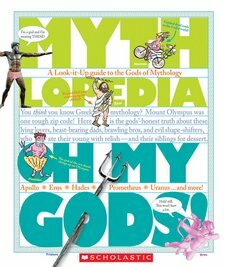 Scholastic’s Mythlopedia books are a great way to do so. * The layout of the pages in these books is very fun with lots of information. * The books are a bit disrespectful of the gods themselves (this is a big deal for a Percy Jackson fan), but if you don’t know anything about the gods when you start to read the books you won’t even notice. * I learned about powers that gods had that I didn’t know about before. 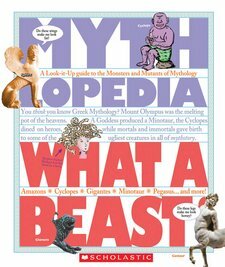 * Overall, I think these are a great introduction to the fascinating world of Greek gods, myths and monsters. Thanks to Scholastic Books, I’ve got a set of the four books in the Mythlopedia series to give away. You get one entry for each way that you connect with WanderMom.com. This giveaway ends on Wednesday June 23 at 11:59pm. This entry was posted in Giveaways, Passports with Purpose and tagged Books For Kids, Greek Gods, Mythlopedia, Percy Jackson, Scholastic on June 17, 2010 by wandermom. Subscribed to feed and filled out form. Would love to win this. My son loves mythology! Thanks. Again, many thanks to you! Also, I “Like” WanderMom on Facebook! Thanks so much for the chance to win this great set! My boys would love reading these. Subscribed to your feed through Google Reader. Thanks so much for hosting this cool giveaway! I filled out the form you linked but it didn’t ask me which ways I connect to you. I’m an email subscriber, thanks! I also subscribe through google reader RSS feed, thanks! I “Like” WanderMom on Facebook. Love these books! Check out my blog post at: http://vivaciousb.blogspot.com/ Thanks! I like Wandermom on Facebook.